Chau Say Tevoda is a small temple of similar design and floor plan to that of Thommanon located across the street (except for additional gopuras and library), but for years appeared as Thommanon’s neglected sister, languishing in significantly worse condition than Thommanon, which had been restored back in the 1960s. Chau Say Tevoda is now undergoing an extensive restoration project, for the moment allowing the visitor a close up look at the restoration process. 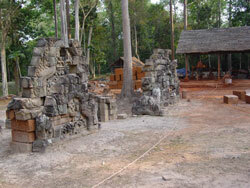 The small section of the temple pictured to the left is currently in the process of being reconstructed. 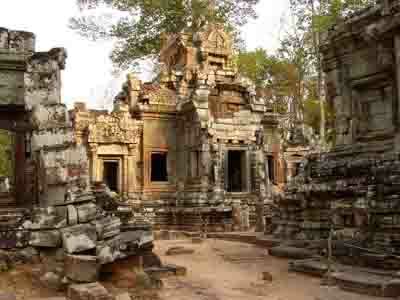 Chau Say Tevoda seems to stand in partnership with Thommanon, but in fact was built much later in Suryavarman II’s rule. Chau Say Tevoda displays some well-executed carvings that are in still fair condition, especially those on the eastern gopura. Though most carvings are Hindu-themed, there are also some Buddhist-themed reliefs. 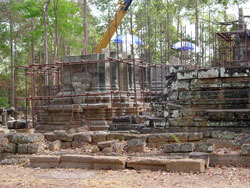 The eastern walkway from the temple leads to the Siem Reap River a few hundred meters away..